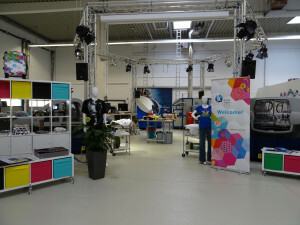 Kornit Digital Europe will conduct an Open House event targeted at textile printing professionals who want to learn about the possibilities of pigment printing with the Kornit targeted at Allegro roll-to-roll system.The event will take place at the company’s showroom in Düsseldorf, Germany on November 23 and 24. The keynote presentation of the “Pigment Power Day” will be delivered by Kornit’s VP of Product Strategy Omer Kulka who is widely known as an expert and speaker on fashion, textile production and supply chain topics. During the event, Kornit will demonstrate the live production of tailor-made textile accessories, based on the company’s “Allegro & Cut” workflow. Visitors will also be able to see the Allegro printing with Kornit’s new Neon ink.The new Pink and Yellow inks enable new applications with brighter colors and extended gamut, allowing Allegro users to penetrate new market segments and to increase system utilization. Being in the beta phase right now, the new inks will be commercially available from the beginning of next year. Additional partners and speakers include Allegro user Mariano Dias from Blur, a leading Portuguese fashion printer, cutting specialist Zünd, workflow and software partners, fabric vendors and more. Attendees are asked to register before the event.